Doc Chey's Noodle House was near our hotel in Asheville, and walking by it multiple times had me intrigued. It was cold, so I was in the mood for something warm. Since it was too late for lunch and too early for dinner, we were able to get a seat right away. Once we got in, the place really started to get busy! There was a line of people waiting for seats, so we felt lucky to be seated. The menu was full of Chinese/Thai fusion dishes, from small plates/soups to noodle bowls to rice plates. Sadly, there was no steamed dumpling dim sum on the menu, which I'd been looking forward to. Happily, they had delicious udon to enjoy! I chose the Japanese Yakiudon: carrot, onion and greens with udon noodles in sweet, tangy tonkatsu sauce. Yum! I gobbled it up. 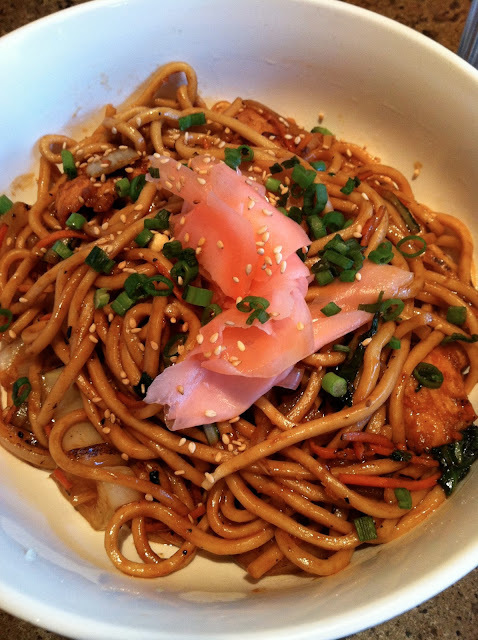 Duke enjoyed his Tomato Ginger noodle bowl, which I likened to an Italian spin on udon noodles. If you're in Asheville, it might be worth checking out this restaurant, at least just to try it once. It was the ideal warm meal on a frigid day. Doc Chey's !!! I used to go to the original location in VA Highlands in ATL in college. Delish. Massage Without Borders... Help Needed!